The Nexus S 4G SPH-D720 was released by Samsung on the Sprint network in Q4 2010. It has a Super AMOLED WVGA PenTile display that uses organic LED technology for a dramatic improvement in color reproduction and screen brightness. The Sprint 4G model uses Sprint’s WiMAX pseudo-4G network in additional to EVDO Rev. A 3G speeds. As with all other Google Nexus branded phones, the phone is shipped with a factory-unlockable bootloader to allow third-party firmware images to be installed with ease. The Nexus S series of phones also uses the Woflson WM8994 DAC (Digital-to-Analog Converter) – when this is used with the Voodoo Sound application, the audio that comes from this phone is absolutely phenomenal. The Nexus S family of phones is also the only phone certified to fly on the International Space Station as part of the “Smart SPHERES” micro-satellite research program. 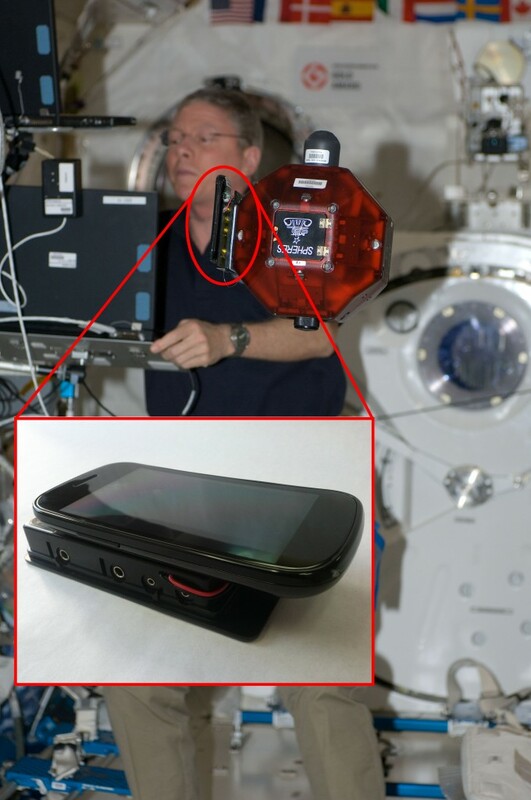 Detail showing Google Nexus S used in NASA Smart SPHERES experiment.